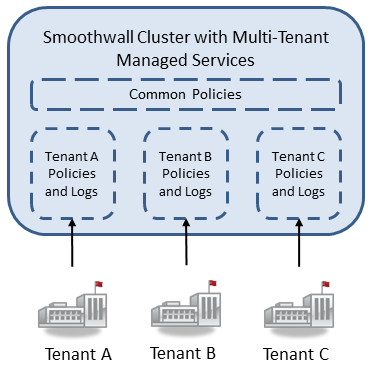 Smoothwall Multi-Tenant Managed Services, referred to as Multi-Tenant, is designed to allow you to deploy your Smoothwall filter as a managed service for discrete individual clients, referred to as tenants. It provides a means of logically partitioning a Smoothwall into multiple virtual instances. Each instance, or tenant, applies a core set of policies for all customers, as well as policies designed for individual tenants. A Multi-Tenant system can only provide filtering services to clients configured as tenants. 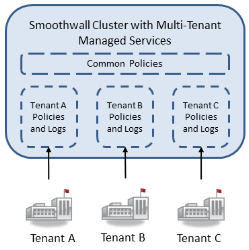 It is not possible to configure your Smoothwall to support tenant, and non-tenant modes. For a detailed description of how to configure tenants, see About Multi-Tenant Managed Services. Each tenant must be linked to a directory service for user authentication. These can be centrally provided, or local to the tenant itself. 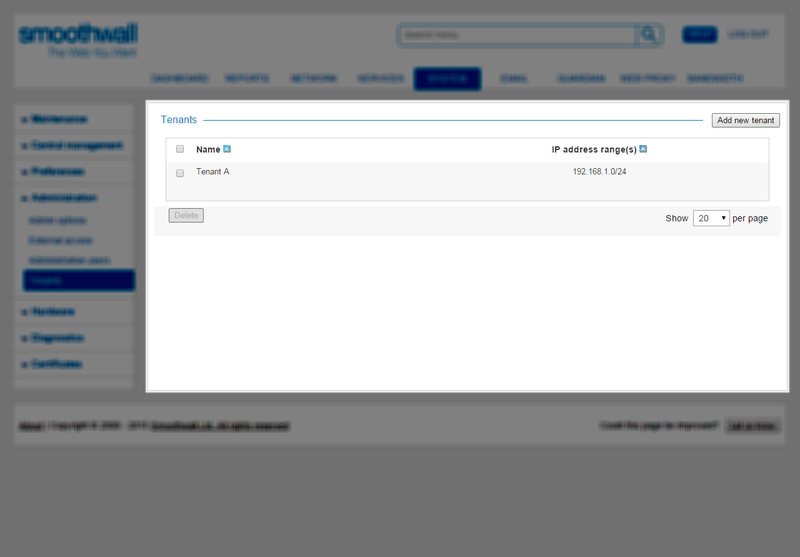 The full range of Smoothwall directory service configurations are available for individual tenants. For more information, see …About Directory Services. 1. Go to System > Administration > Tenants. 2. Highlight the relevant tenant. 4. Adjust the configuration as required. For a detailed description of each setting, see Creating Tenants. For more information, see …About Directory Services. 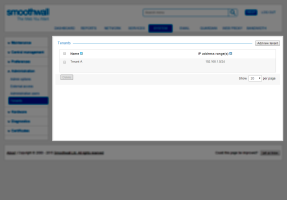 The Smoothwall will display Deleted tenant against categories or content modifications for deleted tenants. 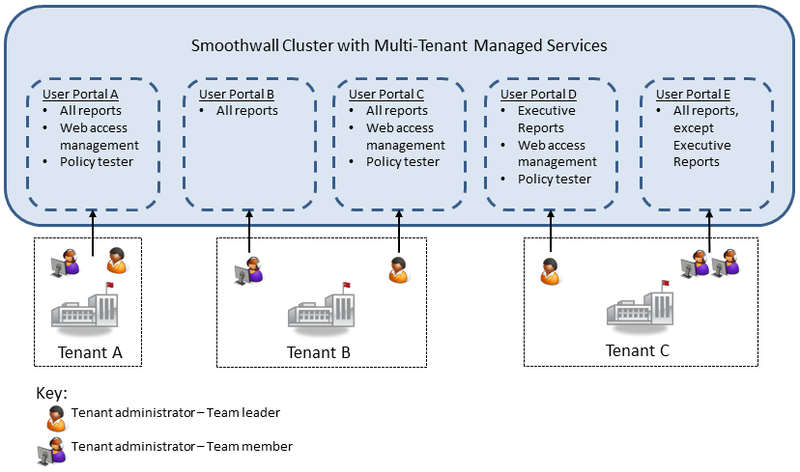 It is recommended you install a multi-tenant Smoothwall alongside your existing centrally-managed Smoothwall. You can then migrate configuration data from each node in your existing Smoothwall to a tenant at a convenient time. 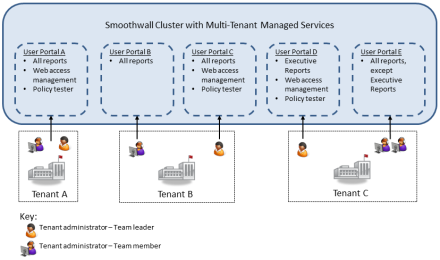 Just as you cannot migrate from a non-multi-tenant Smoothwall to a multi-tenant installation, you cannot revert back to a non-multi-tenant mode. Backwards compatibility of tenant configurations to non-tenant configurations is also not supported.